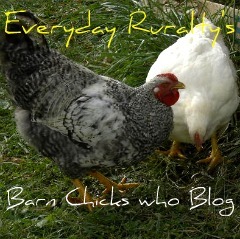 Welcome to another week of Barn Chicks who Blog. Today I will be visiting with Farmer's Wyfe at the blog, Pumpkin Pie Painter. This lady has a wonderful blog. The first thing you'll notice is her lovely artwork. I can only show you a few things here, but I highly suggest that you drop by and see her great paintings. I also couldn't help but notice how thankful she is for the things in her life. It's inspiring. She's a pretty woman who is thankful for her blessings. May you continue to be blessed, Farmer's Wyfe. My favorite post on her blog is one about making cream cheese. In it she realizes that she is using rennet and her daughter is reading aloud about the same ingredient in a Little House Book. I really think you'd enjoy it. Now, let's get on with the interview. 1. Tell us a little about your farm. Our farm the result of my husband saving his money since he was about 12 years old. He knew as a boy that he wanted to farm, so he put pretty nearly every penny he could toward saving for one. The purchase of our farm is a really neat story. It involves some amazing elements; but being as it is a rather detailed story, I'll just leave it at God rewarding my husband's hard work and diligence with "a neat story" embraced by answered prayers. I hope to write about it on my blog sometime soon. We own 30 acres of pasture and tillable ground with a small wetlands area. I love the layout of the land: it was one of the first things that drew me to this farm. Our stone home was built in 1850 and needed quite a bit of work when we bought it. It has a lot of character. I feel amazed that I get to live here. I had that feeling, "I can't believe this is real; pinch me" every morning for the first year that we lived here. Well, I guess I still feel that way, quite often. 2. What animals live on your farm? We farm beef cows (purchase about 10 bottle-fed babies every summer, so we always have between 10 - 20 steer roaming around),and raise some pigs for ourselves and some friends. We have two weird looking guinea birds to keep the ticks at bay. 3. How do the animals get their names? Well, quite honestly, I don't. After I named our first steer and he was butchered, I heard myself saying, "We're eating some steaks from Charlie Brown tonight." I realized it probably wasn't a good idea. My 8-year-old daughter does name a couple of them, the ones she favors. Smile was her favorite last season, and I actually really liked him myself. He was a little more friendly than usual, which made it a little bit hard when it was time for him to go: but we can't really afford to keep a 1500 lb. pet around. The kids name the pigs: we have Salt and Pepper right now. Of course, we name the keepers: the cats and dog and fish. The kids name them, except Fido, because he was in our lives before they were. 4. Do either you or your husband come from a farming background? My husband's parents encouraged my Farmer to enjoy raising animals. They lived on 10 acres and had goats and chickens and a couple of cows came and went: a farmette. They did not make their living farming. Of course, neither do we. But every little bit helps in life. 5. Do you cook, garden, or can? I live with a world-famous chef...well, not really. I often tell my Farmer that he should have been a chef and just had a farm on the side. He can make nearly anything taste delicious. My husband has taught me most of my cooking. I didn't know much when I married; probably a good thing so I cook the way he likes. I do can and freeze a lot of our food, as my husband also likes to garden. He plants and weeds, I pick and can. I didn't know much about gardening or anything about canning when I married my Farmer. My mother-in-law taught me everything canning and much about organic gardening. Can you tell my husband was taking a huge risk by marrying this totally "non-farming" woman?! 6. I really enjoy seeing all of your beautiful paintings when I read your blog. How did you learn to paint? I've been drawing and painting since I first picked up a crayon. In fact, I won the Kindergarten coloring contest >HOORAY! !< and got tickets to a Tom Sawyer play from it. The funny thing was, I had absolutely no idea what the teachers were talking about when I won because I was so shy and in my own little world. My mom really encouraged my artistic ability. I also took some art classes while in college, which really helped my understanding of it. 7. What other hobbies do you have? My farmer would tell you I have too many hobbies. He's right. I love trying new things, so I get too many projects going at once. I crochet, make jewelry, work with clay, play the piano, have lots of flower gardens, paint any paintable surface such as furniture or decor, stamp cards, enjoy learning about being healthy naturally, sew, and love animals, which works well with helping around the farm. 8. Have your children benefited from being raised on a farm? Farms are great because they impart the reality of how fragile life is; teach responsibility with animals and planning ahead for the winter months; show the importance of faith in God during bad times as well as good: droughts or other casualties that depend on weather or other uncontrollable circumstances. I don't do well with uncertainty or unexpected tragedies myself, so we all learn living on a farm. One of our full-grown steer fell into the trough and suffocated a few summers back. When we found him, I stood there in the barn bawling while Violet ran and got the phone to call her father. Farms are tough sometimes, but the good things they bring to life are priceless. But really, I think children benefit from having opportunities to work and learn at the same time, no matter what your living arrangements are. 9. How do you balance home schooling and farming? Home-schooling is flexible. Farming often demands flexibility. There are certain times of the year that I am needed more, but those times with farming usually fall when school is out: like canning or bottle feeding the cows. I do a plant sale and a Christmas craft show, but I just tailor our "school vacations" for around those times. I make sure we get the school done, and I like to keep it pretty scheduled, but sometimes it's not at the same hour of the day. That is why home-schooling is so great! 10. What's your favorite thing about living in the country? My favorite thing about living in the country? That's a hard one. I think the privacy and quiet. The ability to go on the porch first thing when I wake up and sit listening to the birds singing; looking all around and see happy creatures (both our domestic ones and wild ones) going about their day with such contentment and leading such good lives. It's peaceful. 11. Years ago, do you think you'd have been surprised if someone had told you that you'd be a farmer's wife? I am surprised, even though as a child, when a teacher asked me what I wanted to be when I grew up, I answered, "a farmer". My parents are not farmers, not even animal people (well, except for a cat). The only animals we ever had were because I begged them unceasingly for them: and they were all my responsibility. That is absolutely fine. Not everybody is meant for farming life, you have to really love it. It is, in fact, hard work and messy and basically controls most of your life. And expensive. Did I mention how much farm machinery costs? 12. What's in the future for your farm? Chickens!! We'd like to get chickens again (we had them at our first home with 4 acres). I miss the chickens. The kids would really enjoy them. On a larger scale, we've talked about getting breeder cows and raising our own babies as opposed to buying the babies. Our ultimate goal is to save up money so we can buy more land. We'd like to have enough land eventually that one of the kids could farm full-time if they want to. It would give them a better advantage at succeeding at it. Oh, and a skid loader: that definitely has to be our next purchase. These cows make a LOT of manure, and the tractor we have is not efficient in managing it. Funny, I never thought I'd be saving so much money toward cleaning up waste! Even with all the extra expenses of farming, it is worthwhile venture. We've found that working together as a team, all of us, and waiting and praying for the things on our farm, and then watching as those prayers are answered makes ours and our children's faith and appreciation grow. My daughter has asked me why we have to pray and wait for things. Why doesn't God just give us everything we want. I tell my daughter, "God doesn't want spoiled brat children any more than anybody else does." After all, I feel pretty spoiled just being able to live on a farm. Dreams really can come true! 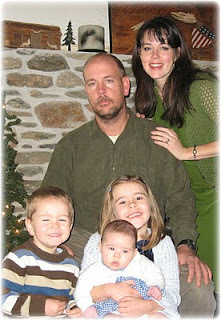 Thank you to Farmer's Wyfe for sharing your farm life and precious family with us. What a great interview. Jealous over all those jars of canned food! Wonderful interview! What a talented lady! What a fabulous interview ~ love it. Great photo of the pantry and WOW, her art work is fantastic. Thanks for sharing. Her canning wall looks like a painted mural, and I am jealous too! Great interview, and a new take someone getting into farming kind of from the ground floor. LOVE the other murals up the stairs and on the cabinet. Off to find her website! What a great interview and subject. Love the canning jar "nest." Beautiful, talented, faithful, hard-working and grateful. She's darn near perfect. :) What a lovely family and home! Thank you so much for the fun interview, Patrice!! It was a new experience for me. Maybe in the future, I can have you over for an interview at my blog! :) Have a super week!! A great interview that I really enjoyed.